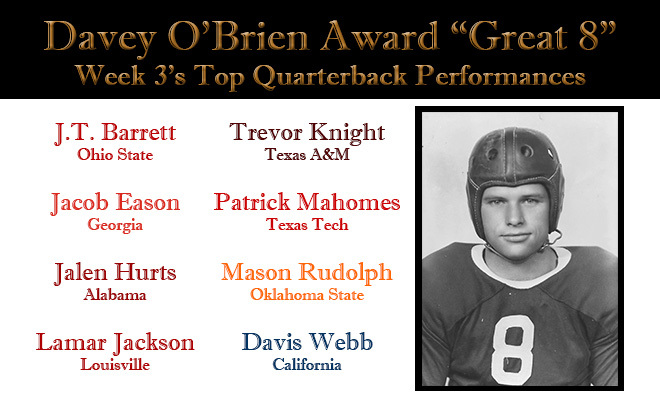 FORT WORTH, Texas (Sept. 19, 2016) – Five quarterbacks who played their high school football in the state of Texas are among the eight signal callers tagged with “Great 8” honors from the Davey O’Brien Foundation for week three of the 2016 season. The eight honorees, as determined by voting from the award’s selection subcommittee, include: J.T. Barrett of Ohio State, Georgia’s Jacob Eason, Jalen Hurts of Alabama, Louisville’s Lamar Jackson, Trevor Knight of Texas A&M, Texas Tech’s Patrick Mahomes, Mason Rudolph of Oklahoma State and California’s Davis Webb. Jackson is on the list for the third time in as many weeks this season. Meanwhile, Mahomes earned his second consecutive nod, while Barrett and Hurts were honorees in week one. Those four players are the only multi-time selections this season. Passed for 152 yards and four touchdowns and ran for 74 yards on 17 carries for the Buckeyes in a 45-24 victory at No. 14 Oklahoma. Jacob Eason, Georgia, Fr., 6-5, 235, Lake Stevens, Wash. Threw the game-winning, 20-yard TD pass on fourth down with 1:31 remaining at Missouri (W, 28-27) and finished 29-of-55 for 308 yards and 3 TDs (1 INT). Ran for 146 yards on 18 carries and was 19 for 31 passing for 158 yards to lead Alabama to a 48-43 comeback win over No. 19 Ole Miss. Scored four rushing touchdowns with 146 yards on the ground, and also had one passing TD (1 INT) and 216 yards in a 63-20 triumph over No. 2 Florida State. Connected on 20-of-40 pass attempts for 247 yards and a score and added 12 carries for 42 yards in a 29-16 win at Auburn. Passed for 470 yards (26-of-36) and five touchdowns and also ran for 37 yards and a score on 12 rushes in a 59-45 victory over Louisiana Tech. Set a school record with 540 passing yards (26 for 46), which included 372 in the first half, and tossed a pair of TD passes in a 45-38 win over Pittsburgh. Led California to a 50-43 upset win over No. 11 Texas by firing four touchdown passes (27-of-40, 396 yards) and also running for a score.